How Early to a Stand That's Close to Where Deer are Bedding? 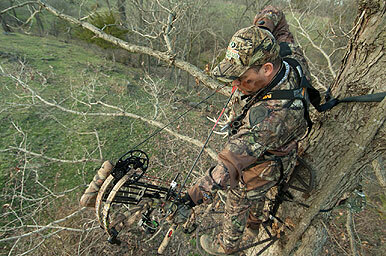 How early to a stand that's close to where deer are bedding depends a lot on the conditions for that day. I hunt a lot of bedding areas and I have learned that on still mornings you need to get in early and go very quiet. Getting settled 30 minutes before legal shooting time is about right, so start early. When the wind is up, I tend to wait a bit longer and head to the stand when I can just start to see some details on the ground. That way, I can walk fast and avoid breaking branches — getting settled only a few minutes before legal shooting time. Small sounds will disappear into the rustling of the leaves on windy days, so you can walk fast without using a flashlight. It is much easier to get to your morning stand undetected on breezy mornings moving in this way than to tiptoe around on still mornings. I love windy days and that is the main reason why.